Poucos brasileiros doam sangue regularmente. Por isso, a Santa Casa de Misericórdia de São Paulo, o maior hospital filantrópico da América Latina, está lançando a ação “Hemoji”, em parceria com a agência Y&R. 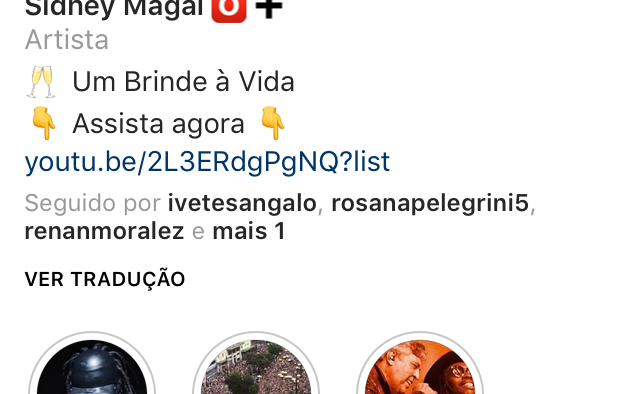 O objetivo é que o maior número possível de pessoas coloque emojis que representam seu tipo sanguíneo ao lado do próprio nome no Twitter e Instagram. São emojis que já existem e podem ser encontrados em qualquer smartphone. A partir disso, é possível criar um sistema inédito para localizar doadores, usando os dados das buscas das próprias plataformas e localizar apenas o tipo de sangue necessário. A ação, que já está acontecendo nas redes sociais, gera visibilidade à causa pois possibilita o envolvimento constante da comunidade e já conquistou nomes como Carolina Dieckmann, Sabrina Sato, Carol Castro, Sidney Magal, Flávia Alessandra, João Guilherme, Adriane Galisteu, Nah Cardoso, Ana Hickmann e Malvino Salvador. I enjoy you because of your own hard work on this web site. Ellie loves getting into internet research and it’s really obvious why. A lot of people notice all of the powerful way you produce practical tactics on this blog and in addition invigorate participation from others on the matter and my princess is truly discovering a lot. Take pleasure in the remaining portion of the year. You are always performing a pretty cool job. Needed to create you this bit of remark to help thank you yet again on the great information you’ve documented above. This is really strangely open-handed with people like you to present unreservedly exactly what a few people would have distributed for an electronic book to get some bucks for themselves, especially now that you might have tried it if you ever wanted. The tricks as well served to provide a good way to be sure that most people have the same interest really like my very own to know the truth lots more with reference to this condition. I think there are several more pleasant periods ahead for folks who discover your blog. I not to mention my buddies were found to be checking the good secrets from your web page and then all of the sudden I had a terrible feeling I had not expressed respect to the blog owner for them. The men came so joyful to learn all of them and have now undoubtedly been loving them. We appreciate you actually being quite helpful and for settling on varieties of important themes millions of individuals are really desirous to understand about. My very own sincere apologies for not expressing appreciation to sooner. I really wanted to develop a quick note so as to say thanks to you for those splendid ideas you are writing at this website. My extended internet investigation has at the end been compensated with really good ideas to share with my good friends. I would say that we site visitors actually are definitely endowed to live in a fabulous website with so many special professionals with useful principles. I feel quite grateful to have discovered your entire webpages and look forward to some more pleasurable minutes reading here. Thank you once more for a lot of things. I must convey my love for your kindness in support of men who really want help on this important theme. Your real commitment to passing the message all over had become amazingly practical and have empowered others much like me to arrive at their targets. This insightful useful information implies so much to me and far more to my fellow workers. Thanks a lot; from each one of us. I wanted to post you that bit of remark just to give many thanks yet again for your personal awesome secrets you have featured above. This is remarkably generous with people like you to supply openly just what a lot of folks could possibly have offered for sale for an e-book in making some profit on their own, particularly now that you could have done it if you ever decided. These tricks also acted to become good way to know that most people have the identical desire just like my personal own to find out a lot more around this matter. I know there are numerous more pleasant opportunities ahead for those who look over your blog post. I intended to put you one very little word to say thanks a lot the moment again for those beautiful strategies you have shown here. This has been so wonderfully generous with people like you to allow openly precisely what a lot of people could possibly have distributed for an electronic book to generate some dough for their own end, precisely now that you might well have done it in the event you considered necessary. The principles likewise worked like the easy way to be certain that the rest have the identical dream the same as my own to figure out whole lot more with reference to this issue. I believe there are lots of more fun times in the future for those who looked at your website. My husband and i ended up being so thankful Michael could carry out his analysis from the ideas he made using your blog. It is now and again perplexing just to happen to be releasing helpful tips which often many people might have been selling. We really see we need the website owner to appreciate for that. The specific explanations you made, the simple website navigation, the friendships you make it possible to create – it is most impressive, and it is leading our son in addition to our family know that this idea is brilliant, and that’s quite important. Many thanks for the whole thing! I definitely wanted to type a quick word so as to thank you for some of the lovely instructions you are posting at this website. My prolonged internet lookup has at the end of the day been recognized with professional facts and strategies to exchange with my family and friends. I ‘d believe that we visitors actually are unequivocally blessed to be in a fantastic site with very many lovely people with good plans. I feel really blessed to have come across the website and look forward to some more fun times reading here. Thanks a lot once again for a lot of things. I actually wanted to make a quick comment to be able to express gratitude to you for some of the amazing steps you are giving out at this website. My time consuming internet research has now been rewarded with incredibly good concept to exchange with my neighbours. I would believe that most of us site visitors are definitely blessed to exist in a superb site with very many outstanding professionals with beneficial things. I feel very blessed to have come across your entire webpages and look forward to some more entertaining moments reading here. Thank you again for all the details. I needed to put you this very small observation so as to thank you very much the moment again considering the amazing information you have contributed on this page. This is simply shockingly open-handed of people like you to deliver extensively exactly what a lot of people could possibly have advertised as an electronic book in making some money for themselves, precisely considering the fact that you might well have tried it in case you wanted. Those creative ideas additionally worked like the good way to fully grasp some people have the identical passion similar to my personal own to see great deal more with reference to this issue. I am sure there are many more pleasurable times in the future for individuals that scan your website. Thank you a lot for providing individuals with an extremely remarkable opportunity to check tips from this website. It really is so pleasing and stuffed with fun for me and my office friends to search the blog at the least thrice every week to read the new guidance you have got. Not to mention, I’m so certainly satisfied with the magnificent knowledge served by you. Certain 4 points on this page are in truth the finest we have had. Thanks for all of your efforts on this site. My mother really likes carrying out internet research and it’s really simple to grasp why. My spouse and i learn all regarding the dynamic ways you convey effective tips and tricks through this web blog and as well cause response from some others on the point so our own daughter is actually learning a lot. Have fun with the rest of the year. You have been performing a useful job. Thanks for each of your work on this site. Debby really likes setting aside time for research and it is easy to understand why. A number of us learn all relating to the powerful method you make both useful and interesting guidance on your web blog and therefore encourage participation from website visitors on this topic while our princess is always becoming educated so much. Take advantage of the remaining portion of the year. You have been performing a useful job. I am just writing to make you know what a beneficial experience my cousin’s child went through reading through your web site. She discovered such a lot of pieces, which include what it’s like to possess an ideal coaching style to make the others without hassle understand chosen advanced subject matter. You truly exceeded readers’ desires. Thanks for rendering those practical, safe, edifying and fun guidance on your topic to Evelyn. I’m just commenting to let you know what a brilliant encounter our princess encountered reading your webblog. She realized some pieces, with the inclusion of what it’s like to possess a wonderful coaching style to get folks without difficulty thoroughly grasp several advanced subject matter. You truly exceeded people’s desires. Thanks for giving the valuable, trusted, explanatory not to mention unique tips about the topic to Gloria. I have to express some appreciation to you just for rescuing me from this type of matter. Just after scouting throughout the online world and seeing suggestions which were not beneficial, I assumed my life was well over. Being alive minus the strategies to the problems you’ve sorted out by way of your main posting is a crucial case, and the ones that might have badly damaged my career if I had not encountered your web page. Your good mastery and kindness in controlling all the things was excellent. I don’t know what I would’ve done if I had not discovered such a subject like this. It’s possible to at this moment look ahead to my future. Thanks a lot very much for this skilled and amazing help. I will not hesitate to propose the website to anybody who wants and needs direction about this problem. A lot of thanks for every one of your hard work on this website. My aunt really loves carrying out investigations and it is obvious why. We learn all regarding the lively manner you present priceless guidance by means of your website and as well increase participation from some others on that concept while our daughter is without question studying a great deal. Enjoy the rest of the new year. You have been carrying out a really good job. My wife and i have been now more than happy that Emmanuel managed to do his survey through the entire ideas he discovered in your web pages. It’s not at all simplistic to simply always be giving out tips which the rest might have been trying to sell. So we remember we have got the writer to be grateful to because of that. The entire explanations you have made, the straightforward site navigation, the friendships you can give support to instill – it is all great, and it’s really assisting our son and the family imagine that the situation is enjoyable, and that is unbelievably serious. Thanks for the whole lot! Thanks for each of your efforts on this site. My mum really loves getting into internet research and it’s really easy to understand why. Most people notice all regarding the lively ways you offer very useful strategies via this web blog and therefore foster contribution from some other people on this area of interest plus our favorite princess is now understanding a lot. Enjoy the remaining portion of the year. You are always conducting a powerful job.